Local youth stencil warnings at storm water drains, a project developed by the Eagle River Watershed Council and funded through Eagle County's Neighborhood Partnership Program. EAGLE — A community project doesn’t have to cost a lot to mean a lot to the people who live nearby. A park bench by the river or a new piece of playground equipment can be very important to the people who will use it every day, and those types of projects cost just $1,000s as opposed to $10,000s, $100,000s or even more. But even though they carry relatively small price tags, these projects can remain unattainable in communities. While they are too expensive for individuals or organizations to complete on their own, their modest price tags ironically mean they don’t meet criteria for large grant programs. But last year, Eagle County launched a program tailored to address small-scale community projects with the Neighborhood Partnership Program. Funded with $50,000 from the county’s capitol improvements budget, the program was billed as a new way to empower and support grassroots generated community projects. Last week, the Eagle County commissioners reviewed what the program funded in 2017 and approved a new $50,000 allocation for 2018. Adam Palmer, Eagle County sustainable communities director, said the 2017 grant program was an experiment to see what communities would come up with. In response, grant requests that ranged from $1,400 to $300,000 were submitted. A committee of county representatives reviewed the various requests and focused in on small projects that fell in the $10,000 or less category. From there, funding went out for various efforts such as playground improvements at the Aspens Mobile Home Park, raised community garden beds at Lake Creek Village Apartments and a drain stenciling project spearheaded by the Eagle River Watershed Council. But even as the program handed out dollars to complete these grassroots efforts, Palmer noted that the Neighborhood Partnership Program learned that it needed to do a better job of reaching out to people. Palmer noted in its first year, at times the program struggled to connect with the kinds of community-centered efforts it was designed to address. “The committee expressed challenges with considering funding requests for larger projects that already had significant, dedicated funding from other sources and whose fate would be based on other factors, regardless of Neighborhood Partnership Program funds,” the report noted. “We didn’t want to be something where large projects leveraged money for matching grants,” Palmer said. Palmer noted moving into 2018, the Neighborhood Partnership Program has identified two big improvements — the need to more effectively tell its story and to revise its application process. Moving forward, people involved with the program plan to reach out to neighborhoods, organizations and individuals to let them know there is money available and to assist them in identifying prospective improvements. By reworking its application process, the program hopes it can become a grant request training tool for communities that will help people learn the skills they need to apply for funding. Additionally, Palmer noted that the program is looking at a rolling application period so the committee can respond to funding requests in a more timely manner. A rolling application process would also give grant requests a timeline that meets individual community needs. “We are still learning, and we want to find the right balance,” Palmer said. The scope of the Neighborhood Partnership Program is wider than its $50,000 funding, Palmer said. “It’s kind of a community empowerment approach,” he said. For example, the $5,075 allocated to the Eagle River Watershed Council provided more than painted messages at storm water drains around the valley. It also funded an educational opportunity and a community involvement effort. “Eagle River Watershed Council recognizes that education and community awareness are key in addressing and improving the water quality issues affecting the Eagle River and its tributaries,” said Elizabeth Schoder, of the Eagle River Watershed Council. She noted that one of the three known primary stressors in the Eagle River watershed, as identified by the Eagle County Water Quality Action Plan, is the untreated storm water runoff from impervious and urban areas. “Storm-water education is an easy, first line of defense in combating the threats to the river. The storm drain-marking program involved a collaboration with local youth to address non-point source pollution entering our waterways untreated through our storm drains,” she said. 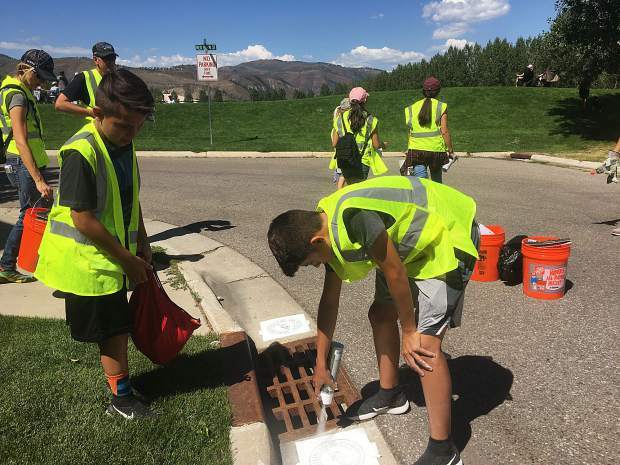 Community youth organizations and volunteers stenciled more than 100 identified storm drains throughout Eagle County — specifically in Two Rivers in Dotsero, Buckhorn Valley in Gypsum, Miller Ranch and surrounding Edwards and downtown Avon. “Under the supervision of an adult, half of the group marked the storm drains with spray paint and stencils in both English and Spanish that read, ‘Dump No Waste, Drains to River,”’ while the other half went door-to-door to engage local residents about this important issue in their neighborhood,” Schoder said. As the paint wears off with time and weathering, the watershed council plans to re-educate the community with a repainting effort and grow this program to other neighborhoods.